Herm Edwards, NFL Analyst. Former Football Coach and Player. Leadership Speaker. 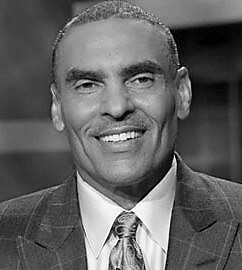 Former NFL head coach and player Herm Edwards joined ESPN in March 2009 as an NFL studio analyst. Among Edwards’ other responsibilities, he called weekly SEC prime time college football games alongside Clay Matvick on ESPNU in 2010, and he worked alongside Rece Davis and Chris Spielman in August 2009 to call the Dike-New Hartford at Aplington-Parkersburg (Iowa) high school football game on ESPN. The game marked the emotional return to the field for Aplington-Parkersburg, which lost its legendary football coach Ed Thomas in a tragic school shooting two months earlier. Edwards also participated in the 2011 SportsCenter series “Back to School,” where he returned to his hometown of Monterey, Calif., to coach his former high school team, the Monterey H.S. Toreadores. Edwards spent eight years as an NFL head coach with the New York Jets (2001-05) and Kansas City Chiefs (2006-08). He led his teams to four playoff appearances, including 2004 when his Jets squad finished with a 10-6 regular season record and advanced to the AFC Divisional Playoffs. Edwards, who also guided the Chiefs to a Wild Card berth in 2006, is one of only four NFL coaches to lead two different teams to the playoffs in his first season as head coach with those teams. The first graduate of the NFL’s Minority Coaching Fellowship (1987), Edwards began his coaching career as a defensive backs coach at San Jose State University (1987-89). He joined the NFL ranks as a scout with the Chiefs in 1990 and was with the club for four seasons (1992-95) as a defensive backs coach and in his final year as a member of the pro personnel department before joining Tony Dungy’s staff in Tampa Bay. He served as the Bucs assistant head coach and defensive backs coach from 1996-2000. Edwards played defensive back for 10 NFL seasons (1977-86), mostly for the Philadelphia Eagles where he recorded 38 career interceptions. He played seven games for the Atlanta Falcons and Los Angeles Rams during his final season in 1986. Edwards was a member of the Eagles’ Super Bowl team in 1980 and is also known for recovering the fumble by Giants quarterback Joe Pisarcik – and returning it for a game-winning 26-yard touchdown — on one of the most unusual plays in NFL history, dubbed “The Miracle at the Meadowlands” during the closing seconds of the Eagles-Giants game on Nov. 19, 1978. A native of Seaside, Calif., Edwards attended the University of California, Berkeley for two years before graduating from San Diego State University with a degree in Criminal Justice. He was appointed a charter member of the Fritz Pollard Alliance and named a member of the Positive Coaching Alliance’s National Advisory Committee in 2003. Edwards also remains active in numerous charitable and philanthropic endeavors, including the Juvenile Diabetes Research Foundation (JDRF) and the Herm Edwards Youth Foundation which he created in 1985 with the goal of making a direct impact on the lives of underprivileged children. Edwards co-authored the book You Play to Win the Game – Leadership Lessons for Success On and Off the Field with ESPN’s Shelley Smith, and he was involved in longtime NFL referee Jim Tunney’s book, It’s the Will, Not the Skill – Principles and Philosophies of Success as Seen Through the Eyes, Mind and Heart of Herm Edwards. He also worked local broadcasts of Eagles preseason games in 2009.